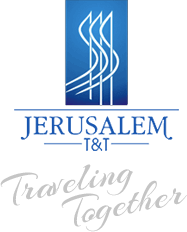 Jerusalem T&T combines more than 60 years of experience in the travel business to provide the ultimate service and quality. Longevity in this business is the direct result of consistently providing exceptional customer service. The professional staff at Jerusalem T&T is dedicated to maintaining the company's high standards by working diligently, one detail at a time, to provide our clients with memories that last a lifetime. We carefully evaluate the needs of each individual client or group and work hard, not to just meet their needs but to exceed their expectations!